Jailbreak white iPhone 4 is possible. No big deal as its not a new hardware with enhanced security like the iPad 2 device. If you are unaware, white iPhone 4 is now available. Although there is no official statement or press release by Apple. But we have seen a lot of people getting it in different countries. Even there are un-boxing videos etc. Anyways we are there to cover jailbreak news related to white iPhone 4 device. There is nothing new related to security. It appears to be the same device. The only difference is that its WHITE. You can easily jailbreak it with the same tools we have posted earlier. You can find links of these jailbreak tools below the image. 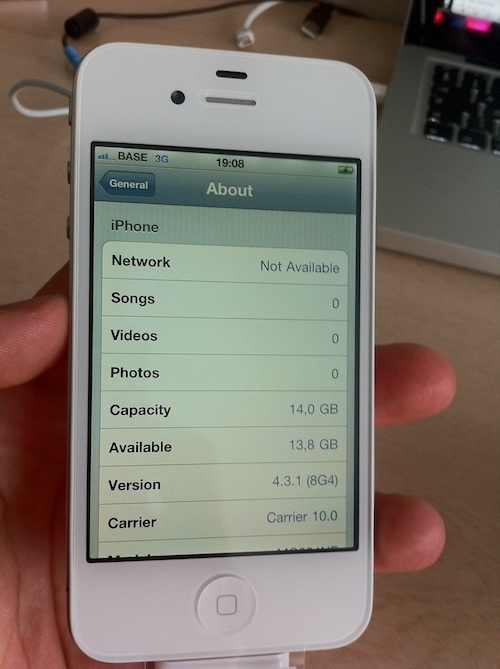 Here is an image of jailbroken white iPhone 4 posted on a forum. The only device which is left which is not jailbreak able till now is the iPad 2 which came up with some advanced security.